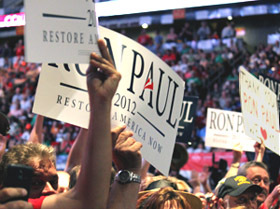 Could a President Ron Paul Accomplish Anything? This question has been asked quite a bit. Here’s a brief answer. (1) If Ron Paul, the most revolutionary candidate in U.S. history, gets elected, it indicates a massive shift in public opinion. Politicians are known for moving with the wind. Congress will be in a mood to work with someone who did the seemingly impossible. (2) He can pardon huge numbers of people, thereby effectively repealing unjust, unconstitutional laws. (3) He can tell the country the truth for four years, both about foreign policy and the economy. He can spend four years encouraging people to study Austrian economics. That is more important than all the legislation in the world. (4) By executive order he can repeal all the bad executive orders. (5) He can refuse to send troops around the world without the consent of Congress. This kind of constitutional deference to Congress has not been seen in generations. That’s what occurs to me offhand. UPDATE: A reader reminds me: think of all the vetoes! I just have one question. Do you believe it is good precedent to pardon based on your view of what the law should be when the law is different? Under the constitution I see that as an abuse of power and usurping the power prematurely to execute legislation. It will set a precedent that could be used in any number of different cases where a sitting president disagreed with a law based on his ideology, and even if you are right in every issue (which I do not agree with) that is a terrifying precedent knowing the chances of never again having a progressive government is very unlikely.